Let us at Best Option Restoration explain how adding heat changes the game. When the temperature of the air is raised, the amount of moisture in the air (GPP) doesn’t change so the vapor pressure doesn’t change, but the maximum possible vapor pressure increases (more grains of water can exist in the warmer air). Liquid water does have a vapor pressure, and it is tied to temperature. If you raise the temperature of the water in the wet material, you raise the vapor pressure. Vapor pressure differential drives evaporation. But temperature is one of the main controls over how fast it happens. The temperature at the surface of a wet material determines the saturation vapor pressure. The higher this temperature is, the higher the vapor pressure will be. The vapor pressure in the air can be determined by its temperature and RH (vapor pressure can be found on the psychrometric chart next to grains per pound). Assuming adequate airflow, the bigger the difference is between these two vapor pressures the faster the evaporation rate. Conversely, the smaller the difference is, the slower the evaporation rate. If the ambient air is already saturated, the material will not dry. When using heat to dry materials, the goal is to maximize the vapor pressure differential by adding heat to provide sufficient evaporation without excessive temperature rise rather than focusing on controlling the moisture content of the air through dehumidification. Since the equilibrium moisture content (EMC) of wood and other hygroscopic materials is linked to the relative humidity of the air, it is a good guide to the eventual lowest attainable moisture content during drying. Air at 80°F and 23% RH has a humidity ratio of 35 gpp and will eventually dry wood to an EMC of 4.9%. Air at 100°F and 23% RH has a humidity ratio of 65 gpp and will eventually dry wood to an EMC of 4.7%, but the evaporation rate will be much faster because the warmer surfaces will produce higher vapor pressure. The 100°F job will require closer monitoring for some of the heat-related issues for example warping or spiliting if not managed. Understanding how to fine-tune the evaporation rate can help guide equipment selection as the drying job progresses. Best Option Restoration techs are experts in this field of Thermal (Heat) Technology. Call us today and we’ll walk you through the process as we are on scene. 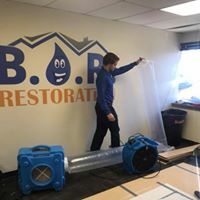 If you’d like to be a Best Option Restoration Franchise Owner and join this Billion Dollar industry, please give us a call at: 720-204-2095 or email our team at info@BORestoration.com. B.O.R. 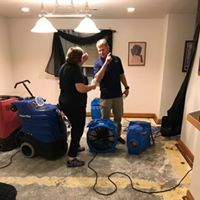 Restoration in Mooresville is part of B.O.R. Restoration Network, a trusted national leader in the disaster restoration industry. Request Franchise Discovery Kit if you’re interested to become a B.O.R. Restoration franchise owner.